Apart from the Users settings tool described in Managing Users in a Graphical Environment, which is designed for basic managing of users, you can use command line tools for managing users and groups that are listed in Command line utilities for managing users and groups. Optionally, you can set a password aging policy. 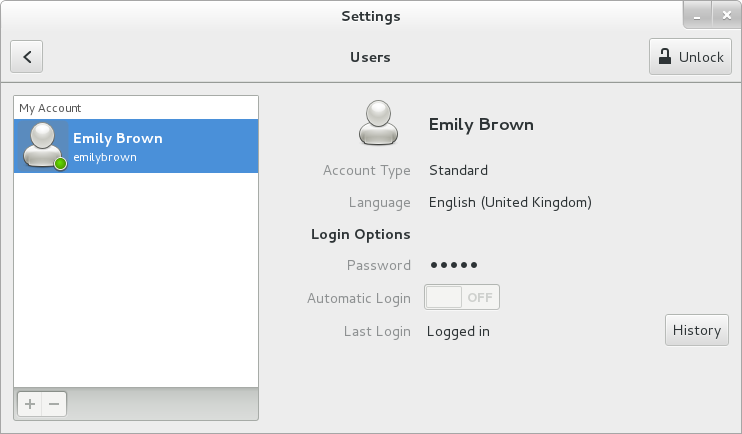 See Enabling Password Aging for information on how to enable password aging. A group with the same name as a user is called a user private group. For more information on user private groups, see User Private Groups. …where options are command-line options as described in Common groupadd command-line options. Shadow passwords must be enabled to use the chage command. For more information, see Shadow Passwords. …where options are command line options as described in chage command line options. When the chage command is followed directly by a username (that is, when no command line options are specified), it displays the specified users current password aging values and allows you to change these values interactively.